Anyone can transcribe the genetic code of bacterial cells in his kitchen at home, says biohacker and research scientist Rüdiger Trojok. He explains in an interview why everyone should deal with biotechnology and what it is that fascinates him about the building-blocks of life. You say everyone should get involved with biotechnology. Why is that? We are all made of cells; and in each of these cells there is a genetic code that, primarily, makes us who we are. In order to understand life, it is essential to recognise the corresponding principles and possibilities: how does a machine work that duplicates genetic information? How do enzymes work, and how can I carry out a genetic test on my own with just a few chemicals and basic laboratory equipment? But isn’t biotechnology too complex to gain such knowledge informally? After all, there are complete study programmes available on this topic. But why would I want to do that – transcribe the genetic code of bacteria? There can be quite different reasons for that. Some people would like to achieve something beneficial – solve a problem, like creating a bacterium that is able to break down certain toxins. For others in turn it is a completely new style of experimental art. They are minimal. Biomaterials are often times overblown in the media as being dangerous – but the reality is that they can notably solve problems. For example, a fork is something that is very practical as an eating utensil, but nobody says that it’s too dangerous because somebody could get hurt. We are all, in the end, biological beings, just like our nutrition and our environment. For biohackers, the important thing is the opportunities and releasing this positive potential. You are considered a biohacker – what exactly do you do? Similar to the way that a programmer writes new computer-software and re-writes existing software, biohackers work with biomaterials and genetic codes. Many people are internationally networked and have their own small laboratories: a few liquids, test tubes and culture media for bacteria, pipettes and maybe a used machine to duplicate DNA, which nowadays can be bought second-hand for just a few hundred euros. 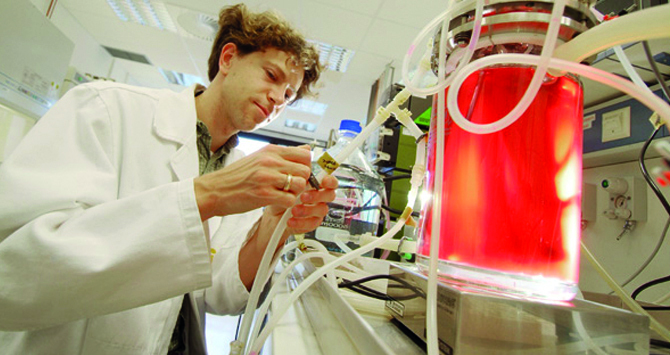 Biohackers are less concerned with academic basic research; rather, it’s the application of the existing biotechnological methods that is important. For example, they make plants glow and use that to make art installations or they try to change bacteria in such a way that they can break down certain toxins on their own. Don’t we need complex technological tools for that? Of course you need a few things, but in this case as well technology is being mystified. Most materials are not really expensive, and much of what you find in professional laboratories could be sold a lot cheaper. By means of a few changes in reconstruction, we were able to lower the cost (down to almost one one-hundredth of the price) of so-called optical forceps, with which one can grasp tiny objects as small as individual cells. Let’s assume that somebody has familiarised himself with the subject and constructed a small laboratory – what specifically is he capable of doing? The possibilities are endless. For example, there is a project where people are trying to find new antibiotics against bacteria that show high resistance. Others are experimenting in the artistic field – an artist in Austria for example coded a small pixel-image in DNA and then allowed the cells to grow and after a while he coded the DNA back into the image. The resulting deviations in the image are a visualisation of the mutations that are constantly changing our genetic code. On the website Hackteria.org, new applications and field reports are always being added. 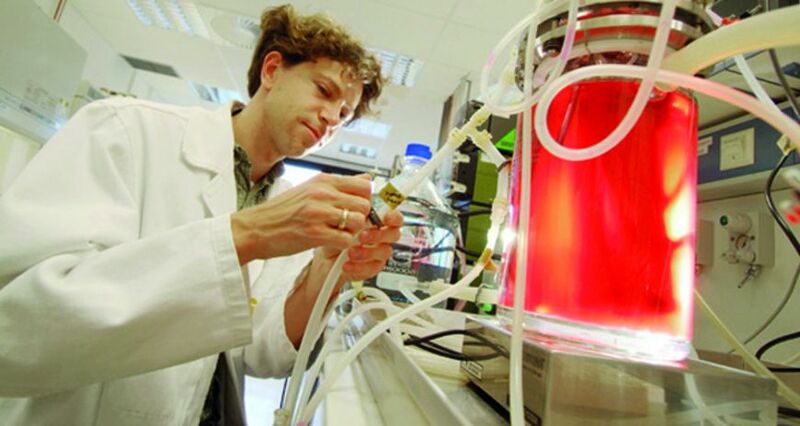 Making biotechnology accessible to the public – you are also working on this at the Karlsruher Institute of Technology, in the Institut für Technikfolgenabschätzung und Systemanalyse (ITAS). You have also been consulting for a while now regarding policies in matter. How can the public be won over for biotechnology despite a lowering of the price obstacle? Information has to be accessible free-of-charge. Patents on certain genetic information should not exist at all. Furthermore, knowledge has to be presented in a better way. I’m currently writing a book with the title “Biohacking – Home-Made Evolution”, which will be published in November in which I explain the fundamentals of biotechnology. As soon as biotechnology is demystified and people get into the topic, they get caught up in it – I see that again and again.